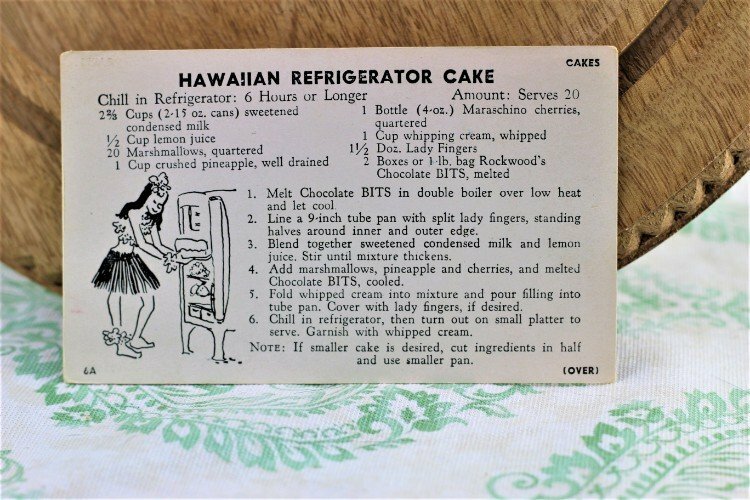 Front of the recipe card for Hawaiian Refrigerator Cake. 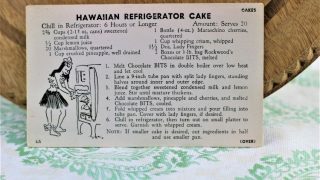 There are lots of fun recipes to read in the box this recipe for Hawaiian Refrigerator Cake was with. Use the links below to view other recipes similar to this Hawaiian Refrigerator Cake recipe. If you make this Hawaiian Refrigerator Cake recipe, please share your photos and comments below! Melt Chocolate BITS in double boiler over low heat and let cool. Line a 9-inch tube pan with split lady fingers, standing halves around inner and outer edge. Blend together sweetened condensed milk and lemon juice. Add marshmallows, pineapple and cherries, and melted Chocolate BITS, cooled. Fold whipped cream into mixture and pour filling into tube pan. Cover with lady fingers, if desired. Chill in refrigerator, then turn out on small platter to serve. NOTE: If smaller cake is desired, cut ingredients in half and use smaller pan.